Francesco Borromini (1599-1667) was born as Francesco Castelli in Ticino in the lake district of Northern Italy, which at that time was actually part of Switzerland (Connors, 1999). The son of a stone-mason, he studied in Milan and may have been taught there by the great geometer Muzio Oddi. The young man finished his apprenticeship and came to Rome in 1619 to work for Carlo Maderno, the Chief Architect of Saint Peter’s Basilica and a fellow Ticinese. In Rome Francesco assumed the name of “Borromini” after San Carlo Borromeo (1538-84), Archbishop of Milan, leading force in the Counter-Reformation, and perhaps a distant relative of his mother. In Rome, Borromini met a young sculptor from Naples, Gian Lorenzo Bernini (1598-1680). Bernini was the most talented and productive of the Baroque sculptors. With his intense creativity and charming personality, he soon became the favorite of the Roman popes. In 1624, Bernini was commissioned to construct the baldacchino over the high altar at Saint Peter’s, and after the death of Carlo Maderno in 1629, he was appointed Chief Architect of Saint Peter’s. For a brief time, Borromini acted as Bernini’s assistant. They did not get along (Morrissey , 2005). They were of opposite temperaments: Bernini was charming and enthusiastic, Borromini was obstinate and melancholic. Borromini felt exploited, and thought that Bernini was not sufficiently grounded in the science of architecture to warrant his position. He severely criticized Bernini’s proposals for the façade and bell-towers of Saint Peter’s. The criticisms were correct and the plans were revised, but Bernini never forgave him. Bernini is the acknowledged genius of the Baroque Age (Hibbard, 1965; Beny & Gunn 1981; Wittkower, 1997; Hopkins, 2002). 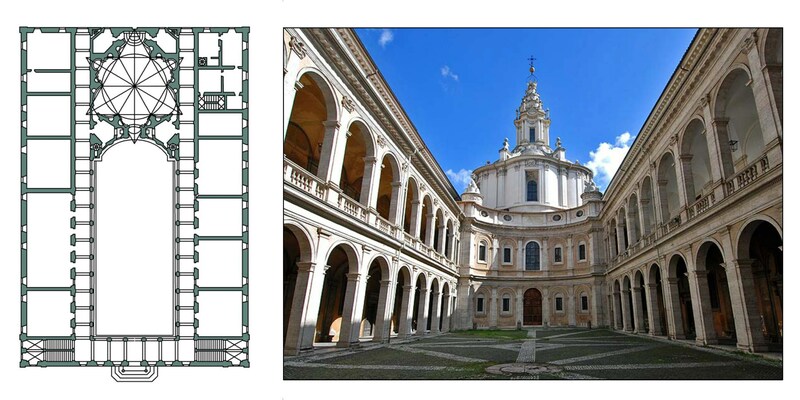 Recently, however, Borromini has become more widely studied (Blunt, 1970; Morrissey, 2005; Conors, 2007). His architecture is characterized by a marvelous sense of the effects of light on curving surfaces. In his geometry one may sense the divine. The Naxos String Quartet No 7 (Davies, 2007) attempts to express in music the emotional effects of his buildings. The movie La Sapienza (Green, 2015) focuses on the visual splendor of his architecture. This posting concerns two small churches in Rome. Borromini’s first independent commission (1638-41) was to construct a small church, fittingly dedicated to San Carlo Borromeo. This Trinitarian church was located on a small space at the southern corner of an intersection with four fountains. Borromini’s design was based on an oval, geometrically constructed using two adjacent equilateral triangles, symbolic of the trinity. 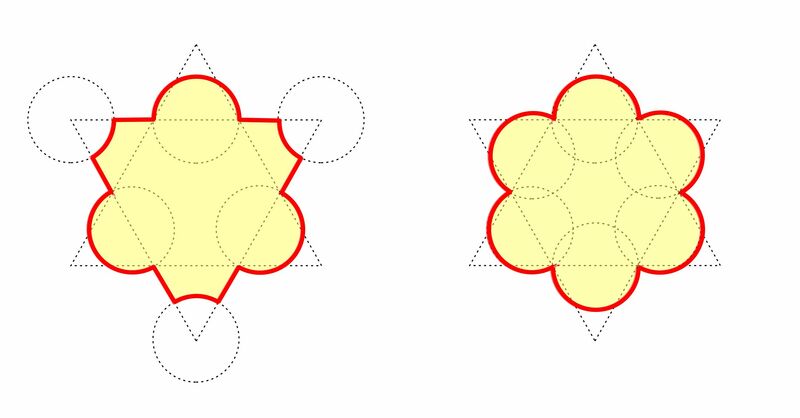 The long circular curves of the oval (red) were drawn using centers (red dots) at each end of the triangles’ adjacent sides. The short curves (blue) were drawn using centers (blue dots) located at each triangle’s centroid. 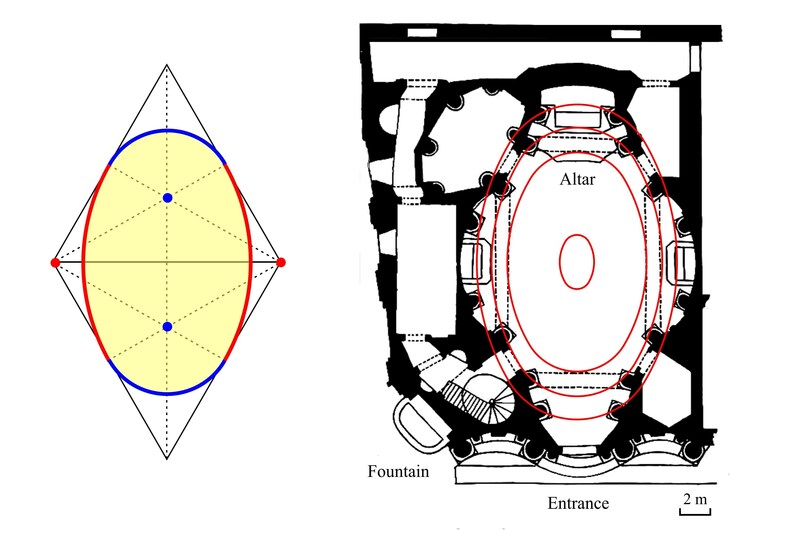 The following figure shows the construction of the oval and the ground plan of the church. The façade is shown in the following figure, together with a cutaway perspective drawing. 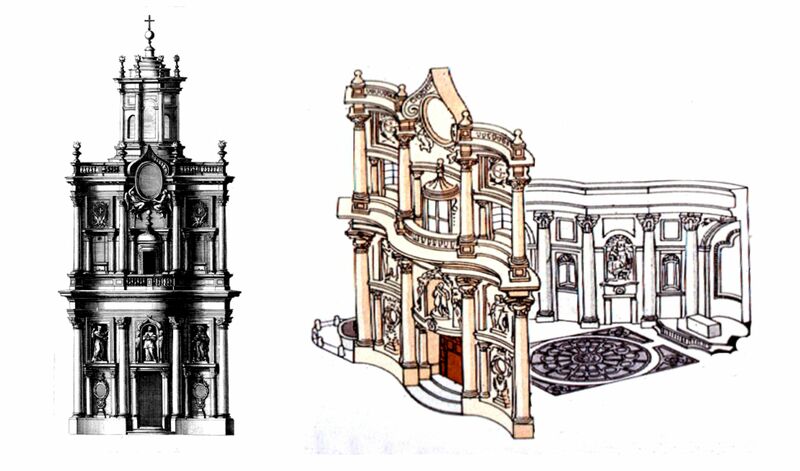 One of the innovations of Baroque Architecture was the use of curves in the façade (discussed in Blunt, 1979, p. 76). Because of funding difficulties, the façade of San Carlo was not finally finished until 1665, but Borromini’s early sketches clearly define its subtle curves. The coffered decoration of the dome is an intricate geometric mesh of octagons hexagons, and crosses. 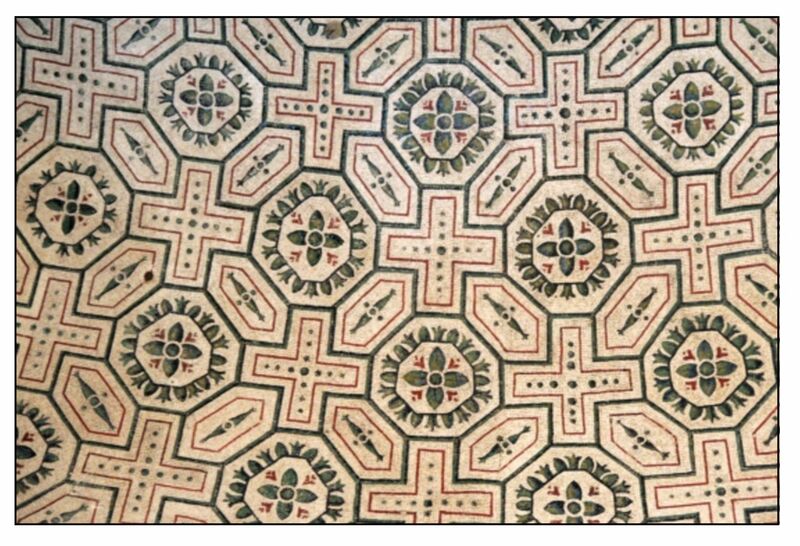 The design is based on the mosaic ceiling of the north ambulatory in the Mausoleum of Santa Costanza just outside the walls of Rome (see figure on the right). This was built in the 4th Century to house the remains Constantia, the daughter of Emperor Constantine I. Borromini not only adapted the design to a dome but also adapted it to give the dome an illusion of greater height. 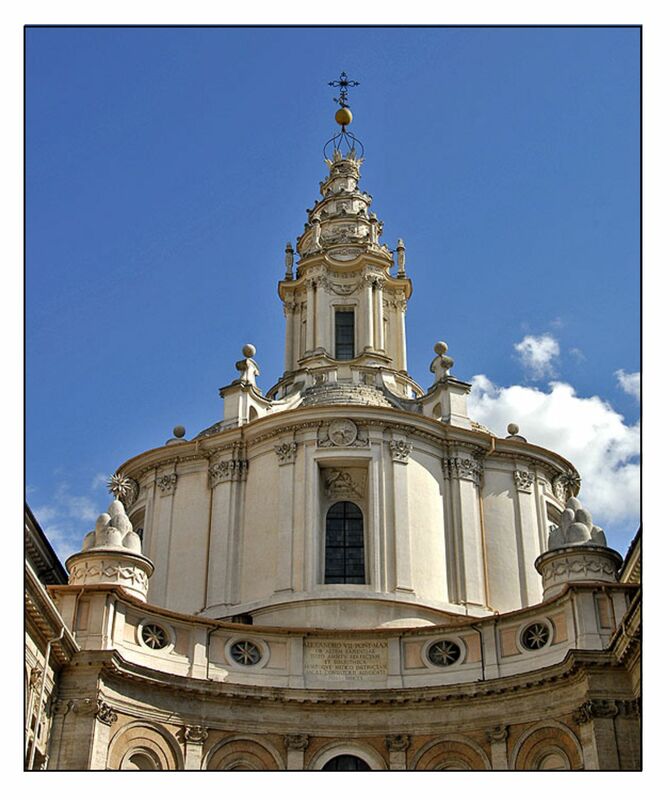 In 1641-1660, Borromini designed and built a church for the University of Rome dedicated to Sant’Ivo, the patron saint of jurists. This was commissioned by Urban VIII (formerly Cardinal Barberini), under whose papacy Galileo had been sentenced to house arrest in 1633. Connors (2007) has suggested that the geometrical purity of its design may have provided a way for the papacy to heal its breech with science. Galileo died in 1642 soon after the church was begun. Urban VIII died in 1644, and the funding for the church fell away. It was only completed in 1660. The breech was difficult to heal. The church is located at one end of the arcaded courtyard of the Palazzo della Sapienza, built by Giacomo della Porta (1533-1602). The following figure shows the floor plan of the palazzo and the church, together with a photograph from Adrian Fletcher’s Paradox Place. On top of the dome, Borromini placed a lantern, and upon that he built a striking spiral staircase that leads to a flaming emblem (Connors, 1996). What this virtuosic construction means has been subject to great debate: Tower of Babel, Lighthouse of Alexandria, beehive (for the Barberini bees) or papal tiara? In essence, the spiral likely indicates the ascent toward wisdom. In the past it was one of the great climbs for the adventurous tourist in Rome. The violent passions of the dark gave way to an amazingly cool rationality during the light. At his request, Borromini was buried in the tomb of Carlo Maderno in San Giovanni in Laterano. The will enjoined his heir and nephew Bernardo to marry the granddaughter of his mentor Maderno. The 17th Century was a time of great changes in how we conceived of the universe and its creator. The heavenly spheres were no longer. The planets moved around the sun and not around the earth. Geometry became a guiding principle for understanding the universe. The circular orbits of Copernicus ceded to the ellipses of Kepler. Kepler used the geometry of perfect solids to explain the different radii of the planetary orbits (Hatch, 2002). And in 1687 all was explained by Newton’s Law of Universal Gravitation. Science was explaining the universe with geometry. God was perhaps a mathematician. 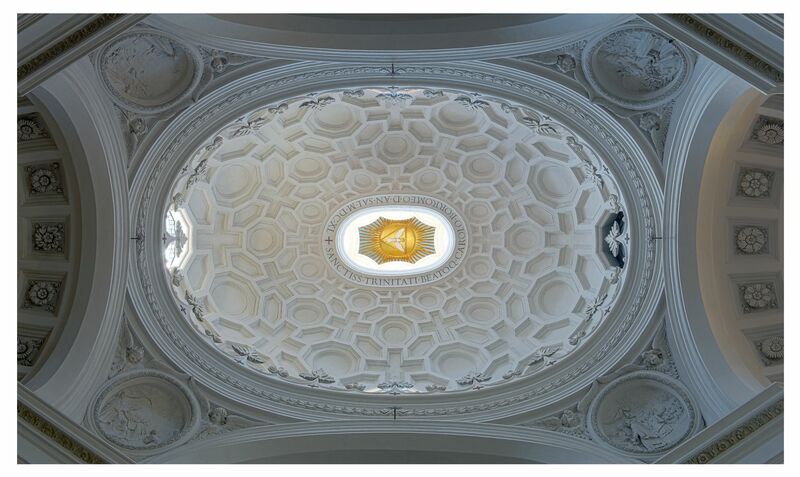 Baroque art, and Borromini in particular, sought for God in the geometrical interplay of curve and light. Beny, R., & Gunn, P. (1981). The churches of Rome. New York: Simon and Schuster. Blunt, A. (1979). Borromini. Cambridge, Mass: Harvard University Press (Belknap). Connors, J. (1996). Borromini’s S. Ivo alla Sapienza: the spiral. The Burlington Magazine, 138, 668-82. Connors, J. (1999). 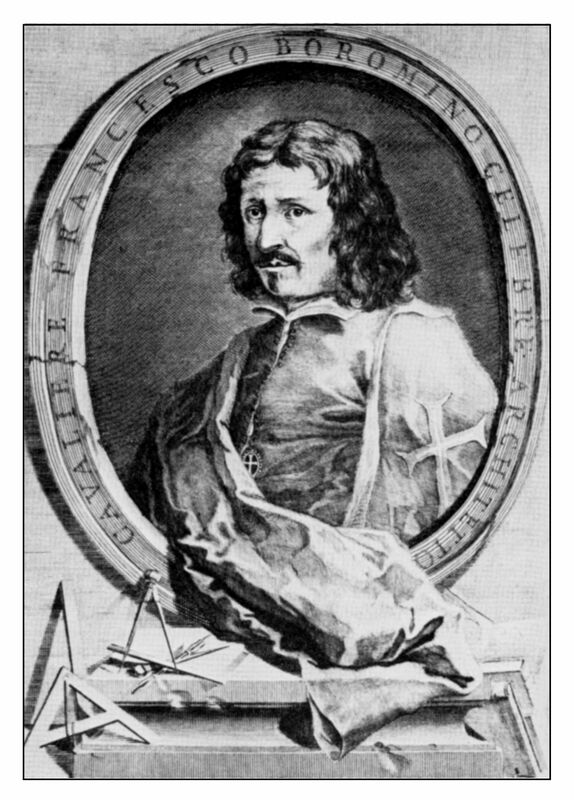 Francesco Borromini. La vita (1599–1667). In R. Bösel, C. L. Frommel. (eds.) Borromini e l’universo barocco. (pp. 7–21) Milan, Electa. Connors, J. (2007). The cultural moment at the beginning of work on S. Ivo alla Sapienza. In L. Mochi Onori, S. Schütze & F. Solinas (Eds.) I Barberini e la cultura europea del Seicento. (pp. 581-86). Rome: De Luca. Green, E. (2015) La Sapienza (DVD). New York, NY: Kino Lorber. Hatch, J. G. (2002). 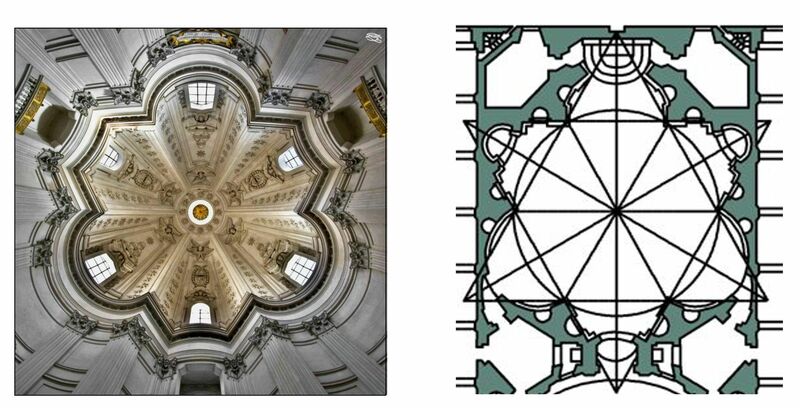 The science behind Francesco Borromini’s divine geometry. In K. Williams and J. F. Rodrigues (Eds). Nexus IV: Architecture and Mathematics. (pp. 127-139). Fucecchio (Florence): Kim Williams Books. Hibbard, H. (1965/1990). Bernini. London: Penguin. Hopkins, A. (2002). Italian architecture: From Michelangelo to Borromini. London: Thames & Hudson. Davies, P. M., & Maggini Quartet. (2007). Naxos quartets nos. 7 and 8. (Sound recording). Hong Kong: Naxos Records. Morrissey, J. P. (2005). The genius in the design: Bernini, Borromini, and the rivalry that transformed Rome. New York: W. Morrow. Wittkower, R., (1997, photographs by Guidolotti, P.). Bernini: The sculptor of the Roman Baroque. London: Phaidon Press.